Ah, poor old Wallis never seems to catch a break. Wallis is a rare English name that means 'a welshman' or 'a celt'. It is also a variant of the name Wallace. 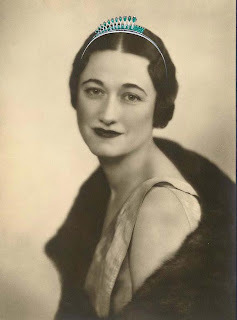 A unisex name that swings more to the male side than to the left, this spelling seems the more feminine of the two due to its connection with the infamous Duchess of Windsor, Wallis Simpson. Like Aphrodite, I think Wallis gets a bad stigma due to the person that it is most associated with. I have to say, I do not think that Wallis Simpson was a bad person, she just happened to have bad luck on her side. Her life would surely have been easier if she and the Duke had married in the 21st century where divorce does not have as much stigma attached and foreigners aren't considered evil forces for the throne, look at the Australian Princess Mary of Denmark, she is beloved by the people of Denmark. Also, the fact that people claim Wallis was a Nazi probably doesn't help (though I don't think she was but that is a matter of personal opinion). I can understand why the name might not be popular in England, despite the clunky-vintage feel that it gives off people still don't have great feelings towards the woman who took the King from the throne. I am surprised that more girls in America don't have the name as it is the 'fairytale' story of the American commoner marrying the Prince. It has never charted in either country, nor has it charted anywhere. Not even five girls in 2011 where given the name which is a shame. I know many don't like the name for what it is but I find it charming and if you give a really feminine middle name it should balance out the first. Male names like Eliot are now popular on girls so this name doesn't go off the grain. The variant Wallace however was given to 83 boys in 2011, which really isn't many considering the number of babies born in the US. For people that like unisex names, this could be another to put on that potential baby name list. I think that it also has a chance with those who like those vintage names like Edith and Sybil. For more information on this name I would recommend reading Upswing Baby Name's article on Wallis.